Why teach English in Vietnam? 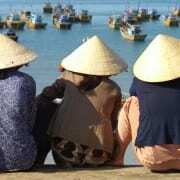 Vietnam offers a unique experience to certified teachers looking for adventure. Enjoy sunny beaches, mountain forests, and a rich culture that balances the old with the new. Most ESL institutes are located in Ho Chi Minh and Hanoi. These schools have been operating for over a decade and are run very professionally by experienced expatriate teachers with an established career in Vietnam. Teachers can apply for TESOL jobs directly from the comfort of their homes because schools sponsor the visa before you arrive. Some schools use recruitment agencies to help with the process. OnTESOL offers free job placement services in Vietnam. Our services include job placement assistance for Amslink and a list of ESL schools for teachers who want to apply for TESOL jobs on their own. Teachers earn US$1,400 to $2,000 per month, plus accommodation, vacation pay, and other benefits. Find teaching tips by our TESOL Diploma graduate in Vietnam! Teaching IELTS is one of the most lucrative job markets in Vietnam. Our TESOL Diploma graduate shares his experience with the teaching methods that he learned in the OnTESOL course. Enjoy! Vietnam is one of the best places to teach English in Asia for those who want to pursue a career in TESOL. Read our Teach English in Vietnam guide to find more information about the best cities for English teachers, how to find a good job, the TESOL certification that you need to get the best TESOL job in Vietnam, and work conditions.